I send greetings of solidarity for all the people gathered for the March against Monsanto. 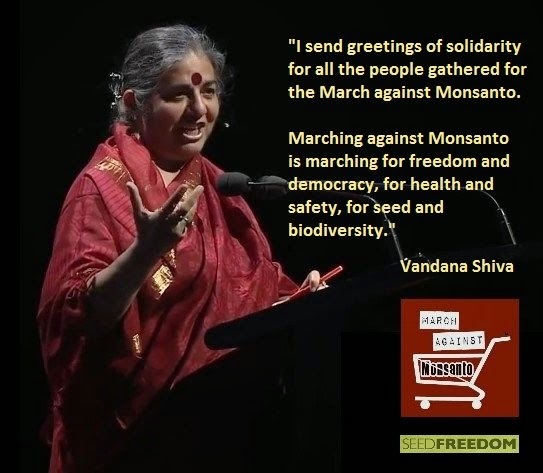 Marching against Monsanto is marching for freedom and democracy, for health and safety, for seed and biodiversity. People often ask me “Why Monsanto”? My response is, we did not choose to target Monsanto, Monsanto chose to target our seed and food freedom, our scientific and democratic institutions, our very lives. Monsanto has admitted it wrote the intellectual property treaty of WTO that allows seeds to be redefined as Monsanto’s intellectual property. And it is through patents that Monsanto, a poison maker, has become a seed giant, with the largest share in control over the seed market. In India it controls 95% of the cotton seed market, and the extraction of superprofits through royalties has trapped our small farmers in unpayable debt. 284,000 farmers have committed suicide in India because of debt linked to seed and chemicals. Corporations like Monsanto were behind the EC Seed law that would have made diversity and seed saving illegal in Europe. The last parliament sent back the law to the European commission. We must ensure that the new parliament does not pass the law. In the US, Monsanto used its money to undermine the Right of US citizens to Know what they eat. It is threatening the State of Vermont because it got a labelling law in place. And it now has introduced a bill in Congress called called The Safe and Accurate Food Labelling Act which has earned itself the name the Dark (Deny Americans the Right to Know) Act. While Monsanto announces that it is retreating from Europe, it is pushing GMOs on the Eastern European countries. And is pushing new trade treaties like TIPP, to undermine Europe’s largely GMO free status, and to get stronger IPR rights on seed. Monsanto have claimed more than 1500 climate resilient patents, and are hoping to use the climate crisis to make even bigger profits. And recently Monsanto took over Climate Corporation, to control climate and weather data, and commodify it. Monsanto wants superprofits through total control over nature and humanity. We seek Seed Freedom, Food Freedom, and Earth Democracy, where all beings on the planet are free and the well being of all is protected, through sharing and caring, through love and compassion, through creating abundance for all. The greed and violence of one corporation cannot be allowed to destroy life on Earth, the lives of our farmers, the lives of our children. 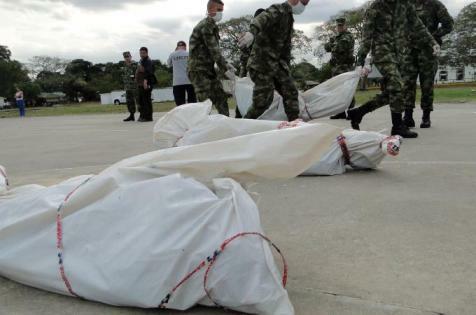 Colombia continues to be ground zero for the U.S.’s crimes against Latin America, and its continued quest to subjugate the region. Several recent events, virtually uncovered in the mainstream press, underscore this reality. These practices by the paramilitaries which act with impunity and with the tacit support of the local police, include disappearances of hundreds of civilians; forced displacement; and the dismemberment of individuals, while they are still alive, in local “chop houses.” That the port town of Buenaventura was to be the model city of the U.S.-Colombia Free Trade Agreement is instructive as to what the wages of free trade truly are. Jose Vivanco of HRW called Buenaventura “the scandal” of Colombia. Sadly, it is not Colombia’s only one. The Army then displayed the bodies of those murdered for all to see, and falsely claimed that they were the bodies of guerillas killed in combat. These are the latest victims of the ongoing “false positive” phenomenon in which nearly 6,000 civilians have been killed by the Colombian military and then falsely passed off as guerillas in order to justify the continued counterinsurgency program in Colombia and the U.S. aid that funds it. As my Colombian friend, Father Francisco de Roux, S.J., recently stated at a peace conference in Washington, “if these ‘false positive’ killings had happened anywhere else, they would have been a scandal!” However, having happened in Colombia, the U.S.’s closest ally in the Western Hemisphere, the killings have elicited a collective yawn from the media and policy-makers. Moreover, “[s]ome of the officers with the largest number of civilian killings committed under their command (Generals Lasprilla, Rodriguez Clavijo, and Montoya, and Colonel Mejia) received significantly more U.S. training, on average than other officers” during the high water mark of the “false positive” scandal. In other words, the U.S. is exporting the abysmal practices of the Colombian military – practices the U.S. has trained them in to begin with — throughout the region. Sadly, the silence in response to this nightmare reality is deafening. Daniel Kovalik is labor and human rights lawyer and teaches International Human Rights at the University of Pittsburgh School of Law. The salmon virus, ISAv is a member of the influenza family and is feared around the world wherever salmon are farmed. Similar to other viruses in the influenza family, ISAv has powerful shape-shifting properties. It tiptoes into new regions, a lethal shadow to the salmon farming industry. At first it does nothing. Chile tried to ignore ISA in 2007. The result was a highly virulent strain that caused $2 billion in damages. Now Chile can't get rid of it. New Zealand is attempting to wrestle away the stigma of ISAv positive results. In eastern Canada so many farms are infected Canada has stopped paying them to cull their fish and just lets the product go to market. So there is a lot of money riding on whether BC and New Zealand are recognized as ISA positive or not. In this blog, I am taking the uncomfortable step of naming government officials and publishing documentation on decisions they are making around ISA virus in BC. You can decide whether their behaviour is justifiable and in the public interest or not. In 2004, Dr. Simon Jones, senior Fisheries and Oceans Canada (DFO) scientist in Nanaimo, received ISA virus positive test results in 100% the Cultus Lake sockeye and 50% of the east Vancouver Island chinook salmon tested. Jones ignored these ominous results; never informed the Soowahlie First Nation, refused to allow publication of the data, and apparently did not report them to the CFIA. It is understandable that Dr. Jones might have doubted such volitile results. But as a federal scientist any positive results for an internationally "notiable" virus should have caused him to follow up with extensive testing. He testified to the commission that he never tested for ISA virus again. Jones should have provided these results to the Cohen Commission, with extensive follow-up testing results and the CFIA should have been notified so that steps could have be taken to make sure ISA virus does not spread into Pacific salmon. Hiding these results was not in the public interest and not scientifically defensible. Dr. Jones remains in his senior position in fish health with DFO. In 2007, the BC Minister of Agriculture in charge of salmon farms asked the BC provincial veterinarian in charge of farmed salmon, Dr. Mark Sheppard, for a briefing on the risk of ISA virus to BC. 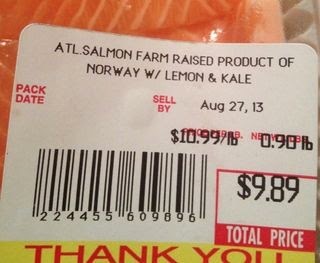 The outbreak was just begining in Chile, with an understanding that it had arrived in Norwegian farmed salmon eggs. Dr Mark Sheppard is a registered veterinarian with the College of Veterinarians of BC. He was in charge of the health of farmed salmon in BC. This is astonishingly inaccurate. In 2007, DFO reports tens of millions of live Atlantic salmon eggs had entered BC for salmon farming and Dr. Sheppard was the man in charge of the health of those Atlantic salmon. How he could inform a minister that no live Atlantic salmon eggs had been imported to BC is hard to fathom! How could the minister fall for so ridiculous a statement? Where did all the millions of Atlantic salmon growing in pens in the Pacific come from? I sent Sheppard's briefing to the College of Veterinarians of BC, through their complaint/disciplinary process. Every veterinarian operating in BC has to be a member of the CVBC. Veterinarians that misinform a minister regarding a notifiable virus have to be discouraged, otherwise BC has no defense against epidemics in the human food supply. On April 29, 2014, Douglas S. Casey, Chair of the Investigation Committee of the Veterinarian College dismissed my complaint saying "... the essence of your complaint was considered by the Cohen Commission..." and the College of Veterinarians can dismiss a complaint if the complaint has been "appropriately dealt with in another proceeding." Download CVBC letter Apr 29,2014. The Cohen Commission did not "appropriately" deal with Dr. Sheppard's briefing to his minister. They made it a public exhibit, Sheppard did not deny he had written it and then the commission raced on with its massive assignment and tight timeline. There was no dealing with it at all. If the Veterinary College views this as sufficient, BC is at high risk of political interference in containing dangerous pathogens. When the OIE reference lab at the Atlantic Veterinarian College, PEI, got ISA virus positive results in BC farm salmon samples, the CFIA initiated intense scrutiny. This PEI lab accurately diagnosed Chile with ISA in 2007 - an outbreak that caused $2 billion in damages. This is the lab that created the ISA testing standards for the OIE. This is the lab New Zealand turned to when farm salmon began dying. The results from this lab where considered accurate until the moment samples from BC and New Zealand came up positive, two regions enjoying beneficial ISA-free trade status. At that point the lab was deemed unreliable, with no public evidence and punished. On November 5, 2012, Dr. Brian Evans, then Chief Veterinarian and Food Safety Officer for Canada, wrote to the World Health Organization for Animal Health (OIE) to inform them that he supported suspending this lab because the ISA virus positive results for BC were "non-repeatable." The lab was suspended. By using the word "non-repeatable" Dr. Evans informs us that the tests had been repeated and that the results were not the same. But despite requests, I have never seen these tests. A year later, the next Chief Veterinary for Canada, Ian Alexander, told me that, in fact, my samples had never been retested. This means the OIE was misinformed and that they suspend the lab with information that was not correct. There had been no verification testing done on the ISA positive samples from BC. Regardless of whether ISA is in BC or not the Chief Veterinarian for Canada should not have used the word "non-repeatable" if the tests had not been repeated. And the OIE should have been concerned that they had been misinformed! This mean the Atlantic Veterinary College results stand unchallenged and BC is at high risk from European ISA virus. So, I wrote to the OIE Director General, Dr. Bernard Vallat, to inform him that the positive results from his lab are, in fact, undisputed. The OIE's ability to prevent global animal pandemics is only as good as the information provided by the member countries. If a member country provides inaccurate information that is a serious breach in the effort to keep dangerous pathogens contained. But Dr. Vallat avoided the subject, by writing to me "I encourage you to take up your questions with the relevant jurisdictions." Since the CFIA was the "relevant" jurisdiction and also the source of my concern this was not helpful and completed dodged a critical look at the threat of ISA to the eastern Pacific. 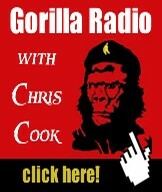 Dr. Brian Evans will now be managing emerging viral trends and trade implications worldwide. I see this as a breakdown and failure of the system devised to protect the world from viruses that are travelling around the world at unprecendented speed and numbers in farm animals being bought and sold internationally. In October 2013, Stephen Harper gave control of the CFIA to Minister of Health, Rona Ambrose, because the Auditor General found the CFIA lacking in their protection of the human food chain. Stephen Harper recognizes there are serious problems with the CFIA. Today, Canada has yet another Chief Veterinarian (3rd in 4 years), Dr. Harpreet Kochhar. In January 2014, I briefed him by email that the CFIA has reversed its position on its handling of a botifiable virus, first saying the tests had been repeated, then saying they had not been repeated. From the evidence I have seen, I believe ISA virus is in BC. However, setting that question aside, the actions of these people are indefensible. Jones should have gone back and carefully retested the Cultus Lake sockeye and the east Vancouver Island Chinook. Then he should have brought all those results to the Cohen Commission so that they could stand the test of scrutiny. Sheppard should have informed the Agriculture Minister that in fact live Atlantic salmon eggs were being imported to BC, that none had been certified as ISA-free before entering the country, because ISA is not on Canada's egg importation forms and since the same companies were operating in Chile and BC, that BC was most certainly at risk from ISA virus. Two successive Chief Veterinarians of Canada should have the same story about whether tests for a notifiable virus had been repeated or not. It is not acceptable that there are two opposite stories regarding a virus in the influenza family in farm animals. And Dr. Bernard Vallat, should be concerned when a country cannot offer a solid line of evidence that one of only 2 ISA virus certified labs was wrong when it detected ISA virus sequence in BC and New Zealand. It is Dr. Evans who, in my opinion, should have been suspended until an investigation was completed on why he called test results "non-repeatable." In closing, if you watch this May 11, 2014 segment of 60 Minutes you will see the senior lawyer for the Cohen Commission face the question; Is ISA virus in BC? This man was privy to half a million government and other documents. He could have said he didn't think ISA virus is in BC, but he didn't. He struggled to find the right words in the legal landscape of his profession and chose the words "I hope not" when asked if it will be too late when ISA is detected in wild salmon, which it has been by numerous government, academic and international labs. I find this a terrible tragedy and I appologize to future generations that I could not stop this short-sighted dangerous stupidity. The magnitude of the risk due to this carelessness is something future generations will bear and I doubt they will be able to understand how all the mechanisms in place failed them. "The goal of elections now is to undermine democracy. They are run by the public relations industry and they’re certainly not trying to create informed voters who’ll make rational choices. They are trying to delude people into making irrational choices. The same techniques that are used to undermine markets are used to undermine democracy. It’s one of the major industries in the country and its basic workings are invisible." 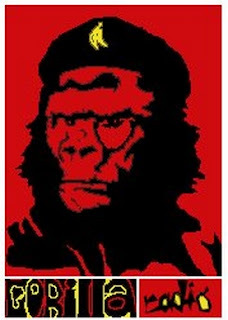 In Indonesia, between 1 and 3 million people were murdered in the years1965/66, in a US -sponsored coup, because there too, was a ‘great danger’ that the people would rule and decide to vote ‘irresponsibly’, bringing the Communist Party of Indonesia (PKI), at that time the third most numerous Communist Party anywhere in the world, to power. "Turning in a blank ballot is a signal unfamiliar to most Britons and Americans, who aren’t yet used to living under a government that has made voting meaningless. In a functioning democracy, one can consider not voting a lazy protest liable to play into the hands of the party in power (as when low Labour turn-out allowed Margaret Thatcher’s re-elections, and Democratic apathy secured both elections of George W Bush). It comes hard to me to admit that a vote is not in itself an act of power, and I was at first blind to the point Saramago’s non-voting voters are making." "Operación Cóndor, also known as Plan Cóndor, Portuguese: Operação Condor) was a campaign of political repression and terror involving intelligence operations and assassination of opponents, officially implemented in 1975 by the right-wing dictatorships of the Southern Cone of South America. The program was intended to eradicate communist or Soviet influence and ideas, and to suppress active or potential opposition movements against the participating governments." "Americans may be encouraged to vote, but not to participate more meaningfully in the political arena. Essentially the election is a method of marginalizing the population. A huge propaganda campaign is mounted to get people to focus on these personalized quadrennial extravaganzas and to think, “That’s politics.” But it isn’t. It’s only a small part of politics. "The population has been carefully excluded from political activity, and not by accident. An enormous amount of work has gone into that disenfranchisement. During the 1960s the outburst of popular participation in democracy terrified the forces of convention, which mounted a fierce counter-campaign. Manifestations show up today on the left as well as the right in the effort to drive democracy back into the hole where it belongs." "The question here, really, is what have we done to democracy? What have we turned it into? What happens once democracy has been used up? When it has been hollowed out and emptied of meaning? What happens when each of its institutions has metastasized into something dangerous? What happens now that democracy and the Free Market have fused into a single predatory organism with a thin, constricted imagination that revolves almost entirely around the idea of maximizing profit? Is it possible to reverse this process? Can something that has mutated go back to being what it used to be?" Because there is plenty of money, so called ‘funding’… members of the elite, the academia, media and non-government organizations, from countries that have been plundered by the West – countries like Indonesia, Philippines, DR Congo, Honduras, or Colombia –send armies of people to get voluntarily indoctrinated, (sorry, to be ‘enlightened’) to learn about democracy from the greatest assassins of genuine ‘people’s power’; from the West. WikiLeaks promises to name the 5th country where MYSTIC mega data collection program is applied. Well, the “Stinky Inky” is at it again. Upset by events in Ukraine, Trudy Rubin is stinking up the Inky with her blatant anti-Putin propaganda. Beyond her inability to get her facts straight, Ms. Rubin has displayed a stunning ignorance of post-Soviet Russia. Mr. Kerry was much clearer when speaking to CBS. “You just don’t in the 21st century behave in 19th century fashion by invading another country on completely trumped up pre-text.” But, presumably uncomfortable with Mr. Kerry’s poor choice of words – which conjured up memories of his support for President George W. Bush’s decision to invade Iraq in 2003, the most serious war crime of the 21st century — Ms. Rubin decided to bail out America’s Hypocrite of State by telling us what he really meant to say. “In other words, 21st-century rules of an interconnected world barred anything as atavistic as forceful seizure of European territory.” Changing Kerry’s words to mean “forceful seizure of European territory,” is something best left to a press secretary or an apologist, not an independent journalist. Ms. Rubin also denounced Russia for threatening to use a gas cutoff as political leverage. Then, she hypocritically urged Western leaders to “brandish the energy weapon when they gather in Europe.” Finally, she also urged the West to provide weapons to Ukraine. Now, it is true that many in the West thought that the collapse of the Soviet Union had brought “the end of history,” as Francis Fukuyama so memorably put it, and inaugurated what Ms. Rubin calls “21st-century rules of an interconnected world.” Democracy and markets had achieved their final triumph over ideology and geopolitical blocs. Now it was the fate of democracy and markets to complete their glorious and inexorable sweep across the rest of the world. According to this conceit of Western triumphalism, the new liberal world order would render geopolitical considerations obsolete (except, of course, when the U.S. felt compelled to invade or bomb another sovereign state). Under the new liberal world order, the gentle penetration of sovereign states by the West’s free markets and democracy was natural and beneficial, even if such free markets and democratic institutions in the West had become pawns in the hands of the Western financial and corporate oligarchs known as the 1%. Nevertheless, any attempt to prevent the West’s gentle penetration was viewed as a violation of the natural and beneficial new liberal world order. And if such penetration in Europe brought benign NATO membership in its wake, so what? However, what the cheerleaders for the new liberal world order have forgotten is the fact that both the United States and Germany – in the persons of Secretary of State James Baker and German Foreign Minister, Hans-Dietrich Genscher — made a decidedly geopolitical promise to Soviet President Mikhail Gorbachev and Soviet Foreign Minister Eduard Shevardnadze. They promised not to extend NATO east of Germany in return for Soviet assistance in the peaceful reunification of Germany under NATO. The Soviet leaders upheld their end of the bargain, but the U.S. – in the person of President Clinton – reneged. In post-Soviet Russia, the new liberal world order took the form of “shock therapy,” which transferred enormous wealth to the oligarchs and severely impoverished millions of Russians during the 1990s. As a result of their experience, many Russians began to associate free markets with outright theft. Russia’s political elite never forgot Clinton’s “stab-in the-back” on NATO enlargement. Neither did they overlook NATO’s revision of its strategic concept that, by 1999, allowed it to undertake offensive military action, even if none of its members had suffered an attack. In December 2004, America’s Richard Holbrooke asserted that “NATO virtually defines our core zone of security in half the world, and danger lurks to the south and east.” He added, “Ukraine, as part of the greatest peacetime military alliance…, gives added comfort and stability to the eastern tier of NATO nations.” He then advocated for Ukraine’s admission to NATO by 2007. Thus, in a profound misreading of Russia’s existential ties to Ukraine – the type that leads to war — Mr. Holbrooke not only arrogantly placed Ukraine in America’s “core zone of security,” he assured his readers that, because previous rounds of NATO expansion had not destroyed relations with Russia, there was no reason to believe that the addition of Ukraine would do so. Russia’s political elites were sensitive to such threats. In fact, they fumed when political leaders in the West paid absolutely no attention to their increasingly vehement objections to NATO interminable expansion, seemingly aimed at Russia’s geopolitical encirclement. Then, in Georgia in 2008, Russia finally fired a shot across the bow of the United States, Europe and NATO. Russia used Georgia’s massive shelling of Russian peacekeepers and others living in Tskhinvali, the capital of South Ossetia, as sufficient reason to invade and split off pieces of Georgia. In March 2014, precisely because the new liberal world order folks didn’t learn their lesson in Georgia, Russia was compelled to fire another shot across the bow of the economic imperialists in the U.S. and Europe. It occurred after protesters in Kiev rejected a comprise agreement – reached by Yanukovych and the opposition parties on 21 February 2013 under the auspices of the foreign ministers of Germany, France and Poland – in favor of the violent overthrow of Yanukovych’s democratically elected government. Consequently, after Western diplomats recklessly cavorted with anti-Russia protesters in Kiev, and after those emboldened protesters (probably hijacked by Pravy Sektor) staged a coup, Russia simultaneously secured its Black Sea Fleet and smacked the West and Ukraine across the face by annexing the Crimea. Now, there will be no NATO in Ukraine, except, perhaps in area surrounding Lviv, the capital of Banderastan. Unfortunately, you’ll find none of this in any column about Ukraine recently written by Trudy Rubin. Whether out of ignorance or malice Ms. Rubin does not acknowledge that Russia, like any other sovereign state, has national interests. Instead, out of ignorance or malice, Ms. Rubin simplistically makes Ukraine all about Vladimir Putin. Out of ignorance or malice, Ms. Rubin’s column of 17 April 2014 was riddled with hysterical gibberish. Consider her inane assertion that “Putin can’t afford to attack NATO countries.” It’s a red herring, born out of hysteria. “Russia is engaging in a massive propaganda campaign about events in Ukraine,” as Trudy Rubin notes. But the West is engaging in a similarly massive propaganda campaign. Simply read NATO’s extremely biased 14 April rebuttal of Russia’s allegations. Unfortunately, Ms. Rubin also is spreading anti-Russian propaganda. She is wrong to assert, Yanukovych’s ‘government fell not because of a plot, but because special Ukrainian forces, with advisers from Moscow, killed dozens of demonstrators.’ She appears to be unaware that ARD German television found evidence that much of the murderous sniper fire came from the Hotel Ukraina, which was tightly controlled by Kiev’s protesters. She fails to mention the European Union-mediated agreement struck between the opposition and Yanukovych, only to be rejected by protesters led by extreme right-wing members of Svoboda and Pravy Sektor. Highly respected sociologist, Volodymyr Ishchenko — an expert in civil disturbances in Ukraine — claimed that the far right had hijacked the protest. Dr. Anton Shekhovtsov, an expert on Ukraine and right-wing parties in Europe says this about Pravy Sektor (Right Sector). “What is frightening, however, with Pravy Sektor itself is that it comprises many groups that I would call neo-Nazi. Fortunately, they also constitute a minor element of Pravy Sektor, but they are there. Dmitro Yarosh, who is the leader of the Trident, of Trizub-it’s the name of the organization — it may be not racist itself, but it cooperates with the real nasty people who are part of the Pravy Sektor, like Patriot of Ukraine.” [“Crisis in Ukraine: The Role and Responsibility of the West.” Carnegie Council for Ethics in International Affairs, February 7, 2014. Nevertheless, in a column titled, “A veiled threat to Ukrainian Jews” Ms. Rubin goes to great lengths, admittedly without any proof, to blame Russia for the obviously fake fliers – requiring Jews to register with the Donetsk People’s Republic — distributed outside a synagogue in Donetsk. But she whitewashes the anti-Semitism of the genuine neo-Nazis who led the protesters in their violent coup against a democratically elected government. Yes, admits Ms. Rubin, Svoboda was denounced as “neo-Nazi” by the World Jewish Congress. But it “appears to be moderating its positions.” In the one sentence she devotes to Pravy Sector, Ms. Rubin simply notes that “Its leaders publicly insist the group is not anti-Semitic.” Well, that settles it then. Doesn’t it? In her most recent opinion column on 21 May 2014, titled “Ukraine’s pivotal revolution,” Ms. Rubin spouts more propaganda. Once again it was a largely peaceful revolution lead by heroic protesters seeking the new liberal world order for Ukraine, not a protest transformed into a violent anti-Russia coup led by Pravy Sektor (Right Sector). Once again it was all about Putin, “with his bare-chested machismo, his homophobia, his odes to tradition and religious orthodoxy, and his disdain for the West.” Once again, Ms. Rubin failed to utter a single word about Russia’s legitimate national interests. Ms. Latynina is a fierce critic of President Putin, but she makes a few observations about Right Sector and its leader, Dmitry Yarosh, that challenge Ms. Rubin’s propaganda. First, she assists in the demolition of Ms. Rubin’s canard about months of peaceful protests by claiming that Right Sector figured prominently in the heavy fighting on Hrushevsky Street on Jan. 19.” (Even the New York Times reported the use of stun grenades by protesters as early as 1 December 2013.) Ms. Rubin, wake up! There was a time when I thought Trudy Rubin was a thoughtful voice on world affairs and a credit to an often abysmally poor Stinky Inky. However, after Russia’s annexation of the Crimea – which shocked the new liberal world order people to their core – Ms. Rubin seems to have degenerated into yet another anti-Putin mainstream media crank. I understand that you are presently undertaking serious consideration of Site C dam to determine whether it is in the best interests of British Columbians. Our organization has undertaken considerable research on this issue and I would like to share some of the highlights with you along with some of the key recommendations of the Joint Review Panel on Site C. I trust you will find this information useful in your deliberations. Given that there are significant adverse effects that would result from Site C, justification for the project must rest on an unambiguous need for the power. Alternative sources of power are available at similar costs, notably geothermal. BC Hydro should conduct more research into energy alternatives. The Panel cannot conclude on the likely accuracy of project cost estimates and recommends that the costs of Site C be assessed by the BCUC. BC Hydro has failed to fully demonstrate the need for Site C at this time. BC Hydro’s analysis of future demand is based on a very serious market failure in the pricing of electricity.The average price for new industry is about $50/ MWh, but the cost of new supply, whether delivered from Site C or other sources, is $100/MWh or more. That clearly attracts more demand than economists would consider economically justified. With Burrard in place, BC would have no shortfall of energy until 2033. Even without Burrard, BC Hydro could meet the future energy needs of the province more cost effectively if they developed single-cycle gas thermal plants which can be built on an ‘as needed’ basis, strategically located and supply low cost energy to meet peak loads. Like Burrard, single-cycle gas thermal plants could enable greater reliable use of non-firm and spot market supplies and would be far less costly than Site C. The savings would be in the hundreds of millions of dollars per year. We wouldn’t be producing energy from gas turbines any more than we have to; in most years we would be using available non-firm hydro and purchases of spot-market energy, which forecasts tell us are going to be much lower costs sources of energy in the future than Site C.
BC Hydro didn’t provide appropriate cost comparisons to alternative sources of power in their analysis. The 1,100 MW capacity of Site C will result in an oversupply of energy for many years after it is commissioned. Clearly, if alternative sources of energy were used, they could be constructed on an incremental, as-needed basis, thus resulting in significant cost savings over time. We wouldn’t end up with a huge initial surplus of power for many years like we would with Site C.
The Panel concludes that there are uncertainties regarding BC Hydro’s long term energy forecasts. Basing a $7.9 billion project on a 20-year demand forecast without an explicit 20-year scenario of prices is not good practise. The Panel recommends that BC Hydro construct a reasonable long-term pricing scenario for electricity and its substitutes and update the associated load forecast, including LNG demand and that this be exposed for public and BCUC comment in a BCUC hearing, before construction begins. Between 2006 and 2009 domestic demand has mostly ‘flat-lined’ at about 50,000 GWhrs while BC Hydro, over a decade ago, forecasted demand to be well over 60,000 GWhrs by 2012. BC Stats show that BC’s population growth rate is decreasing. During the decades of the 70’s, 80’s and 90’s, BC’s population grew by 26%, 19.3% and 20.8 %. In 2000, it shrunk to 12.3% and is expected to be 12.8% this decade. BC Stats has projected the growth rate to be +1.3% for each year beyond that to 2036. Despite this shrinking trend, BC Hydro has projected that residential accounts will increase at annual rates of between 1.3 to 1.7%. Given that BC Hydro residential customer accounts are about 2 million, meaning, on a simple average, every account has 2 people living behind the meter, then BC Hydro’s residential per capita demand is projected to increase at twice the rate that BC Stats expects the population to increase. As hydro rates continue to increase, the public is likely to respond with conservation. BC Hydro reported sales to “Others” is fiscal 2013 of 7,417 GWhrs. Auditors of BC Hydro’s financial report indicated that “Others” were customers outside of BC with long-term purchase contracts. This is more energy than would be produced by Site C. In fact, even though Site C can supply a maximum of 5,100 GWhrs/yr, dams of this size usually only run at about half their potential. Sales to “Others” were at $43/MWh, whereas Site C generated energy would be at least $100/MWh. The area of agricultural land that would be impacted by Site C is grossly under-represented. BC Hydro’s economic evaluation of loss resulting from of the construction of the Site C dam is based on 1,666 hectares of land; that only represents 13% of impacted farmland. The actual impact area is 31,528 hectares of Class 1 to 7 lands. BC Hydro established a baseline for agricultural production in the Peace River Valley that is completely inaccurate: it created a utility rating system that has never been used or even heard of in the agricultural industry; and, it failed to account for the influence of the 50-year flood reserve on existing agricultural production in the Valley. The productivity of the agricultural land in the Peace River Valley is unique not only in the Peace River region, but in Western Canada. It is capable of producing a variety of crops comparable to BC’s fertile Fraser Valley and in some cases the yields from the Peace River Valley are even higher than in those in southern BC. As world prices for food escalate in response to inevitable climate change, population and fossil fuel pressures, the land BC Hydro plan’s to flood for Site C is our food security Plan B. It can produce fruit and vegetables for over a million people. BC Hydro projects total economic activity resulting from agriculture in the Peace River Valley would total $215 million over 100 years. Even using BC Hydro’s own model, with its impoverished impact base of 1,666 hectares (5% of Site C impacted ALR) a more robust horticulture scenario suggests agricultural activities are capable of generating fully $2 billion from farm gate sales and secondary economic activity during this same time frame. This doesn’t measure values associated with human health resulting from better nutrition in Northern communities. According to experts, Site C dam may have a 100-year life. The agricultural land in the Peace River Valley will support life in perpetuity. The Peace River Valley has extraordinarily high value for agriculture and the public interest is better served by allowing it to continue to sustain citizens through agricultural production rather than destroying it for power production. Power can be sourced from other alternatives; agriculture cannot. Given all of the above, it is clear that Site C is not in the best interests of British Columbians. I urge you to give serious consideration to the information I have provided and trust that, in considering the long term interests of the citizens of the province, you will not approve Site C.
The Pope is coming to Palestine, a country under a regime of apartheid and colonialism. The Zionists are greeting him by insisting that they will continue to occupy the site of the last supper and insisting that he visit "Yad Vashem" (a museum exploiting one tragedy to create more holocausts), and "Mount Herzle" named after the guy who is a key architect of ethnic cleansing and colonialism here that cost hundreds of thousands of Arab lives. Christians here (and all other people) have become more and more active in boycotts, divestment, and sanctions against the Zionist regime. Palestine; this text was changed after some uproar though Abu Mazen's pictures remained. The Popular Front for the Liberation of Palestine (PFLP) and many others complained about the unilateral moves and decisions by Abu Mazen without consulting the Palestinian people (and not just his key financially connected yes-men from Fatah). PFLP was promptly denied its financial share from the PLO umbrella (small as it maybe since the PLO was subsumed to the Palestinian Authority and its corrupt officials). These issues and problems portray a liberation movement gone awry after Oslo treacherous agreements. Yet, this does not take away from the justice of the Palestinian cause or the fact that it is inevitable that truth and freedom will prevail. Meanwhile we continue here struggling and sacrificing. Below are glimpses of reality and in particular please note the plight of youth assassinated and prisoners in "administrative detention". Maybe the Pope will say something about this continuing suffering and the lies and mythology that make it all possible. military said they posed direct threats and that they only used rubber bullets. Footage and other evidence was then released by Defense of Children International which shows the military lied. After significant uproar, even the US State Department and CNN had to pay attention but the arrogant Israeli military is still sticking to its lies. My letter to editor in response to a Zionist standard PR. I was a third grader on my first school trip. Gazans were still allowed to cross into Israel in those days, mostly as exploited cheap labor. My family was driven out of Palestine during the Nakba, the "Great Catastrophe" that saw the expulsion of hundreds of thousands of Palestinians from their homes. My family was comprised of simple peasants from the village of Beit Daras. The residents of my village were known for their love of couscous, and for their legendary stubbornness, courage and pride. Beit Daras residents saw in Yafa a center of many aspects of their lives. A commercially vibrant port city, known around the world for its oranges, Yafa was home to some of the largest markets in southern Palestine. Strata of educated elites in Yafa had raised the level of political consciousness of the city to standards that would still be considered high by Middle Eastern criteria today. Politicians, artists, bankers, craftsmen and young and vibrant student communities gave Yafa a middle class that served an essential role in the fight against British colonialism and its Zionist allies many years before the Nakba and the creation of Israel. 'Sido (grandpa) please tell us stories about your adventures in Yafa,' we would plead him, as he sat atop an old mattress in his special corner of a small, decaying house in a refugee camp in Gaza. His stories, which he conveyed with much suspense, trode a fine line between truth and fantasy. When I grew up, I realized that the fantasy was not simply his way to amuse us children, but also a way to express how Yafa represented my grandfather’s greatest triumphs and most humiliating defeats. Yafa, known as the "Bride of Sea" was conquered between April and May, 1948. A major exodus was already underway into Transjordan and Syria. Zionist forces belonging to the Haganah and Irgun set aside their supposed differences as they moved in against Yafa. Three different military campaigns were launched simultaneously - Chametz, Jevussi and Yiftach - through which Yafa, areas around Jerusalem and the whole of eastern Galilee were seized. But when Yafa fell, the pride of Palestine was crushed. While the term Nakba might be a fitting depiction of what befell the Palestinian nation in 1947-48, it is somud - steadfastness - that keeps the millions of refugees holding on tight to their right of return 66 years after the land of orange trees was conquered, and its somud that will keep Yafa alive, forever. - Ramzy Baroud is the Managing Editor of Middle East Eye. He is an internationally-syndicated columnist, a media consultant, an author and the founder of PalestineChronicle.com. His latest book is My Father Was a Freedom Fighter: Gaza’s Untold Story (Pluto Press, London).